There are a lot of choices out there and understanding what you are buying and where it is from is crucial to any decision. On this page I’m going to give a brief overview of the major whiskey producing countries and a brief description of the different whiskeys you can get from them. “And hey, why is whiskey sometimes spelled without the “e”?” (There are many explanations and none of them are certified, but the following is the one I chose to put my faith into.) This goes back to immigrants from Scotland to the United States making “whisky” in the new country. These distillers wanted to differentiate their product from that of their homeland and added an “e”. In truth there is no real difference and to my knowledge there are no legal requirements of distillers to spell it a certain way. But, the terminology has made its way into the vernacular and most people will refer to “whisky” coming from Scotland to be spelled without the “e”, and everywhere else in the world with the “e” including Ireland. It is worth noting there is some debate in certain circles sighting Japanese whiskey as being worthy of the distinction of being spelled without the “e” due to the extreme adherence and study to practices of Scotch Whisky. For the purposes of this blog, I will be spelling it with the “e”. I will also respect the spelling individual companies put on their product. 1. 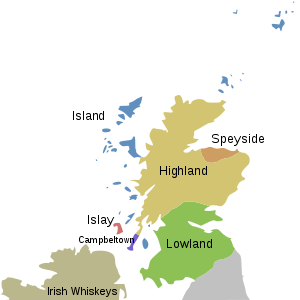 Scotland– this may offend some people out there but Scotland is not the birth place of distilled beverages. The ancient Egyptians can take credit for its origination, but let us give credit where credit is due, Scotland has given us the whisk(e)y we know and love today. The map you see here divides the land up into 5 distinct regions. Over the years, through marketing and branding, each region has developed its own flavor and aroma characteristics a consumer can expect. However, do not be confused! The flavors you might expect to find in one region can be produced in any of the regions! Lastly, are you having trouble saying some of those Distillery names? Check out this web site for some pronunciations by a master! In Scotland there are number of different types of whisky and understanding what each one is can be very confusing, but once you know what they are you can explore them with confidence! Single Malt Scotch– this type of whisky is made from malted barley. Legally it comes from one distillery in Scotland, it is barreled (the barrels must be used casks) and bottled there, and must be aged a minimum of three years. During the process it must not exceed 94.8 ABV, and during bottling, it must not be less than 40% ABV. Vatted Malt/Pure Malt/Blended Malt Scotch– Confused? It is confusing to see these on a label and if you are not careful you can be mislead. The good news is they all mean the same thing. This Scotch has to conform to all the above laws but the difference is the single malt whiskys used to make it come from different distilleries and are blended together. So think of this one as a single malt whisky, but made from different distilleries. 2. Ireland– The Irish are famous for their drink, and like many things Irish, they have created a whiskey that is uniquely their own, Pure Pot Still whiskey. At one time this method was used in Scotland to circumvent taxation, but when the tastes of the Scottish moved away the practice died leaving only the Irish to continue it and make it their own. Pure Pot Still– this whiskey, which again has become uniquely Irish, goes through the same process of making whiskey but it uses both malted and unmalted barley to garner a different flavor/aroma profile. This can also be found in most of the major brands coming out of Ireland and helps create the unique flavors one expects from Irish whiskey. Single malt-the use of just malted barley in the distillation process. Very much the same process as Single Malt Scotch but without the laws, so yes, you can get a single malt from anywhere in the world, it is just illegal to call it Scotch if it was not made in Scotland to their standards. Single Grain-this is the use of grain other than barley in the distillation process. The primary grains are wheat and rye. Blended Whiskey-this again is the same as blended whiskey from Scotland. It uses malted barley and one or more different grains in the process. 3. United States– as you can see from the map taken from MapMuse.com, Kentucky and Tennessee are no longer the only places in the U.S. you can find whiskey. And while bourbon and Tennessee Whiskey are distinctly American, an artisan whiskey explosion has happened and distilleries are popping up across the Union. 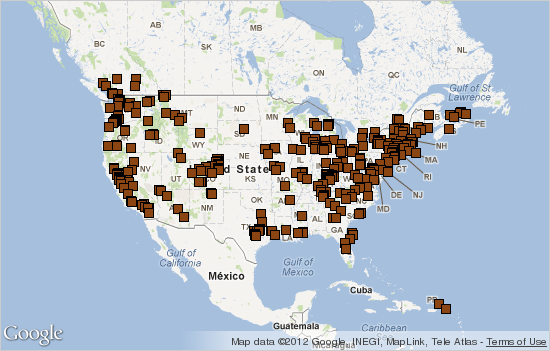 From sea to shining sea the variety of whiskey is growing. Distilleries such as Clear Creek Distiller in Oregon, St. George Spirits in California, and Stranahan’s in Colorado are spearheading the revolution and making names for themselves worldwide. So what does that mean for the consumer, what types of whiskey can we get from the U.S.? Bourbon– let us dispel misconception #1, bourbon does not need to be made in Bourbon County, Kentucky to be called bourbon. But around 95% of it is made there. In 1964 the U.S. Congress ruled bourbon was a distinct product of the United States and created a legal definition for bourbon much like the laws governing Scotch. Bourbon must be made from at least 51% corn. During the distillation process it must not exceed 80% ABV, and it can not be casked at more than 62.5% ABV. It must aged in new, charred, white-oak barrels for at least 2 years. Tennessee Whiskey– this whiskey is made to the same legal specifications as bourbon with one exception, an extra step in the purification process occurs. The extra step is known as the “Lincoln County Press” and was legally recognized by the United States tax authority in 1941. What this means is after the whiskey has been distilled it is run through hard maple charcoal, usually around 10 feet (3 meters) and it is thought this extra step eliminates even more of the impurities found in the liquid, making a more pure, clean spirit. Rye– rye whiskey at one time was the “American whiskey”. Rye overshadowed bourbon in the market and was as robust and confrontational as the people who drank it. Then prohibition hit. Once prohibition was repealed rye was decimated and to this day has not reached its former glory, in sales that is. With all the artisan whiskeys being made the American palate is again ripe for this spirit and it too has made a resurgence. More and more expressions are being made and the quality of this whiskey has reached new heights! Rye whiskey must follow the same laws as bourbon to be called Rye Whiskey, but instead of needing to be 51% corn, it is 51% rye. Corn Whiskey– the true American Moonshine. This whiskey is made from at least 80% corn and can not exceed 80% ABV. The aging process is also drastically different, if it is aged at all. The length of maturation will be more in terms of months instead of years and the final product is usually clear, but can have some coloring. …and everything else. Yes, in the U.S. if one looks hard enough any type of whiskey from single malt to blends can be found. Unfortunately, in my opinion, companies have begun flavoring their whiskeys. Currently the most popular is a honeyed whiskey but others range from cherry, cinnamon, peach, and apple. While I understand the reasoning behind this movement, I do not appreciate it and believe it does take away from the spirit itself. 4. Canada-Canada is an unfortunate story. It is a classic rise and fall from power. In 1920 the United States instituted laws banding the production, sale, distribution, and importation of alcohol. This helped to set the stage for Canadian whiskey makers to fuel the illegal trade of alcoholic beverages and while not openly stating their support of the underground movement in the U.S. a lot the whiskey which came through was Canadian, and it makes sense, they are a very close neighbor. A lot of the illegal practices of mo affiliates such as Al Capone involved Canadian whiskey and the people were still able to get what they wanted. In 1933 the band was lifted, the American people had gained a taste for Canadian whiskey and the market was ripe for the taking. Canada shifted its production and began making whiskey specifically suited to American tastes. This bore fruit and made Canadian whiskey the dominate a type in the U.S. and a power house in the world with the country boasting upwards of 200 distilleries. But tastes change, and the empire fell. It is but a shadow of what is once was and there are few distilleries left, as seen in the map from MapMuse.com (I was not able to find a Canada specific map of distilleries). Canadian whiskey is still widely consumed in the U.S. but it is getting harder and harder to find it in the rest of the world, which is unfortunate, because they can and do produce quality whiskeys. Blended Whiskey- you will be hard pressed to find a whiskey in Canada which is not a blend. Canada does have laws to regulate how whiskey is made. One of such laws is it must be matured for at least 3 years, but it does not need to conform to a percentages of grain such as those in the U.S. Single Malt and other– one can find these other types of whiskey in Canada but they are few and far between. 5. 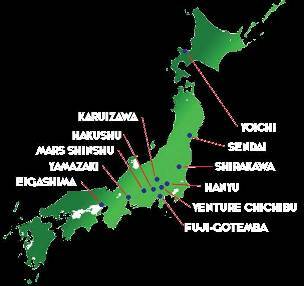 Japan– As you can see from the map, found at alcohology, Japan has established its fair share of distilleries and has fixed its place as a major whiskey producing country. Japan itself boast a fertile land and climate which closely resemble those found in Scotland making it ideal for whiskey production. The industry started in the 1920’s and distillers were sent to Scotland to study with the masters. The practice and art of whiskey making was honed and the knowledge was brought back the shores of Japan. The Japanese took this knowledge and grew it further making the production of whiskey much more scientific. The exploration and creation of different yeasts, different types of water, distillation, fermentation, mashing, and different types of wood used for maturation have been studied in-depth and fully explored giving unique creations and flavor profiles that have become the signature Japanese whiskey. Single Malt– the Japanese, having studied with the Scots have of course made single malt whiskey, but it is a little different. With the considerable amount of research done the Japanese create many different flavored single malts at one distillery and marry those flavors together to create unique and diverse expressions. Blended– as with single malts, the blended whiskeys also posses a very divers flavor profile leading to some very interesting and exciting creations. The blends use different grains to create desired flavors and come from the same distillery. Single Grain– hard to find but it does exist. Follows the same confines as the single malt. Vatted Malt/Pure Malt/Blended Malt- this is somewhat different then the Scotch equivalent. The Japanese are very rigid in their customs and one of those is not to do business with their rivals. This has led to a different definition of vatted malt in Japan. One company will open different distilleries with different goals and will trade barrels of whiskey only from within. There is a movement to get the companies to break with tradition and expand their trade, but traditions are always hard to break. 6. The Rest of the World- the above mentioned countries do not have the market cornered on the creation of whiskey. Many new and interesting takes on this time-honored craft can be found from Africa and to Wales. One country making a mark on the industry is India. With companies such as Amrut making world-class expressions it is hard not to take notice. Another area not far removed from Scotland and Ireland, Wales has also made some well crafted whiskey through the distillery Penderyn. China, while not producing anything of note yet, has become a major importer of Scotch and is in the process of developing their own brands. While these are only a few examples of the ever-growing market, I am excited to see, and sample, what is yet to come!